Deze prijs is voor 1 basiskleur. 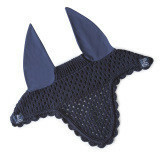 Cotton Fly hood with stretch ears. Customizable with pipings, crystal and in colors.